The 4.9' Prism Sound DB25 to XLR AES3 Breakout Cable is designed for interconnecting digital audio gear in touring setups, recording studios, and mastering houses. 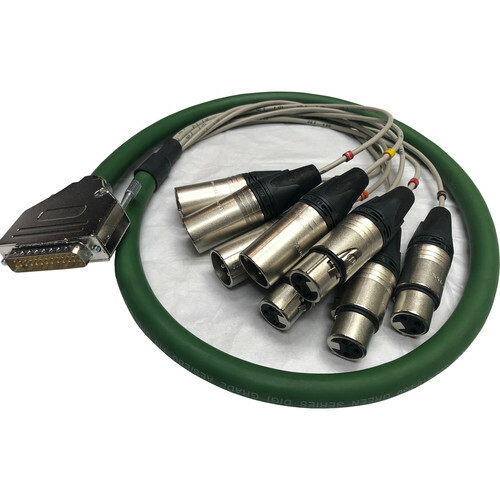 Configured for eight channels of AES3 I/O, it features a DB25 male connector on one end and eight XLR 3-pin jacks (four female and four male) on the other. Use it for efficient hookup of a Prism Sound Dream ADA-8XR audio interface (available separately) and external A/D-D/A converters. Box Dimensions (LxWxH) 9.5 x 8.1 x 2.5"